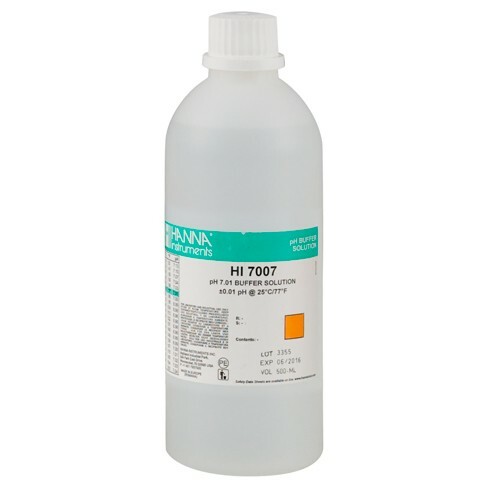 Product information "HI 7007M 7.01 pH Buffer Solution 1 x 230 mL bottle"
pH 7.01 is the most widely used among all buffer solutions. For this reason we have prepared it in a wider variety of sizes to meet every application need. Whether you prefer to have your solutions in 20 mL sachets or if you need larger quantities, HANNA® will satisfy all your needs. HANNA® pH buffer solutions are NIST standardized reference solutions. For the pH standard most widely used for calibration, HANNA® also offers a wide range of buffer solutions in sachets, where the solutions are always fresh and easy-to-use for field applications. HI 50007, HI 60007, HI 70007C, HI 77700C, HI 7007L/C & HI 8007L/C are supplied complete with certificate of analysis. Click on the links below to download the Safety Data Sheet. Related links to "HI 7007M 7.01 pH Buffer Solution 1 x 230 mL bottle"
Customer evaluation for "HI 7007M 7.01 pH Buffer Solution 1 x 230 mL bottle"
Subscribe to the free newsletter and ensure that you will no longer miss any offers or news of Hanna Instruments (Pty) Ltd.